Opened in February 2001, this Best Western 4 star property introduces a fresh approach to accommodation in Hong Kong. 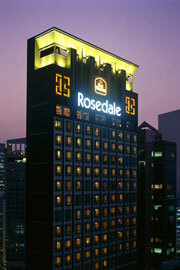 Designed as an intelligent hotel, Rosedale on the park offers unique facilities to support your business or travel needs. 274 rooms in a range of categories ensure comfort and modern facilities with added benefits. Located a stone's throw away from Victoria Park and a short stroll from Causeway Bay, the hotel provides easy access to shopping, dining and entertainment areas. The Japanese Department stores Sogo and Mitsukoshi are within walking distance, as well as many other shops with major brands and labels. Convenient transport links are provided with the MTR just 5 minutes walk away, main bus routes outside the hotel and the always enjoyable Tram Line accross the road. Shuttle service to the Airport is available, please check schedule and make advance booking if necessary The shuttle service in the morning will drop guests off at the Hong Kong Convention and Exhibition Centre at 9:00 am and 9:45 pm. All guest rooms and suites offer individually controlled air-conditioner, ensuite shower and bath tub in-one, IDD telephones, in room laptop port, pay per view movies, satellite and cable TV, tea/coffee making facilities, voicemail, in room portable heater, iron/ironing board and in-room safe. Added benefits include 1 full free stock of the mini bar (second stock is chargeable), portable cordless telephone that can receive and dial out anywhere in the hotel and views of either the Hong Kong Stadium or Victoria park/Harbour views. Superior and Deluxe rooms offer double, twin and Hollywood twin beds with double beds able to extend to queen size. All colours are soft in tone and very bright. Junior Suite and Suite rooms emphasis darker tones, offering same facilities as Superior and Deluxe rooms with the added benefit of a pantry including microwave that can be shut away with a retractable door as well sofa beds in the sitting area. Views comprise Hong Kong Stadium or Victoria/Harbour views.